BRIGHTON – The UK government will look to raise more tax revenues from wealthy citizens, and will not be cutting spending on social welfare and will not hike taxes for low income earners. 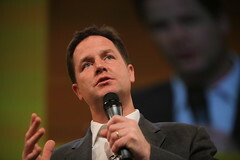 At a conference of the Liberal Democratic Party held in Brighton on September 23rd the Deputy Prime Minister of the UK Nick Clegg said that the government could raise extra tax revenues by implementing a new tax on luxury properties and levying a greater tax on the capital gains realized by the country’s richest taxpayers. Nick Clegg acknowledged that the government will need to continue to tighten its budget, and it will need to ensure that all spending cuts and revenue raising measures are done fairly and should not target low income earners. According to the Deputy Prime Minister, the Liberal Democratic Party, which he currently leads, will continue to push for the Coalition government to implement a 1 percent annual tax on all properties valued in excess of GBP 2 million. More taxes could also be collected from the top 10 percent of earners in the country if the government implemented even further programs to fight tax evasion.